St. Louis Post-Dispatch, Jan 2, 2015 -- Unlike the times Betty Lampitt gave birth, on Wednesday morning she was the one praying the rosary in a corner of the waiting room. It was just an out-patient surgery procedure. And she said her husband of nearly 50 years was quite seasoned. Still, she was concerned. He had to go under anesthesia to have a foreign object removed from his arm. The same left arm was injured back in 1963, not long before they’d met on a blind date. 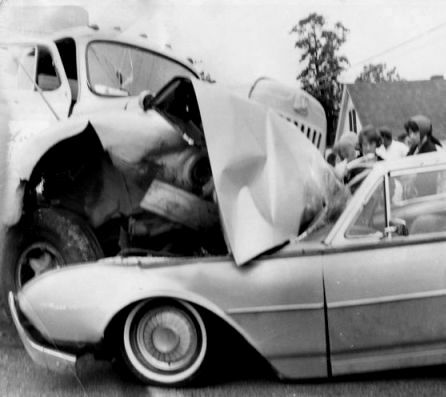 Arthur, a real estate agent at the time, was on his way to show a house when he smashed a brand new Thunderbird head-on into a huge truck. As the family story goes, the wreck was so serious that it was mistakenly reported over the air waves around East Peoria, Ill., as a fatality. The severity of a broken hip drew attention away from Arthur’s arm, which, on the surface, was cut and flecked with broken glass. The arm healed. Arthur and Betty married in 1965. They raised four boys in Granite City. Arthur supported the family by doing appraisals, selling real estate and working odd jobs with his rugged hands. Then, about 10 or 15 years ago, something odd happened during a visit to the courthouse in Jerseyville, Ill., for work. Arthur’s arm set off the metal detector. 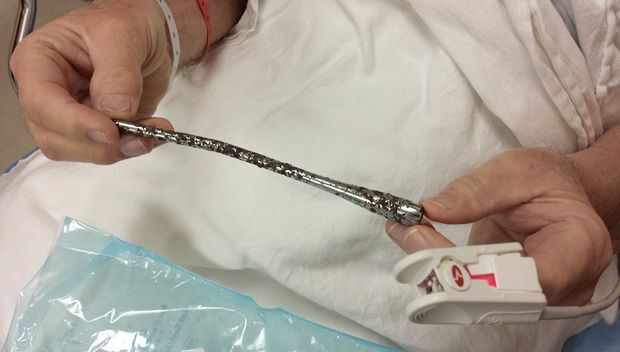 A doctor’s X-ray indicated that a slender object, about the size of a pencil, was stuck in his arm. But because it didn’t cause pain, and he had full use of his arm, Arthur was told to leave it be. It wasn’t until a few weeks ago that something gave out when Arthur was moving concrete blocks for a rental home he’s fixing up. His arm was out of whack. For the first time, he could feel a sharp point in his arm. Speculation spread about what the foreign object was that seemed to be working its way out. Perhaps a medical instrument unwittingly stitched up in the emergency room back in 1963? 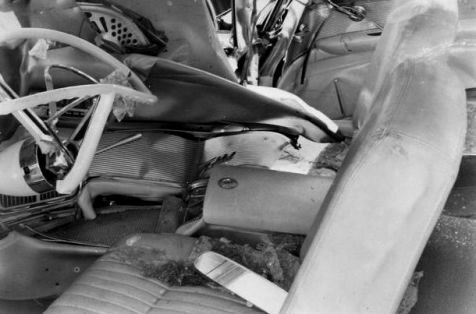 Arthur, 75, unearthed a collection of old photographs of the mangled Thunderbird that a friend took at the scene — the same friend who took Arthur and Betty’s wedding photographs. 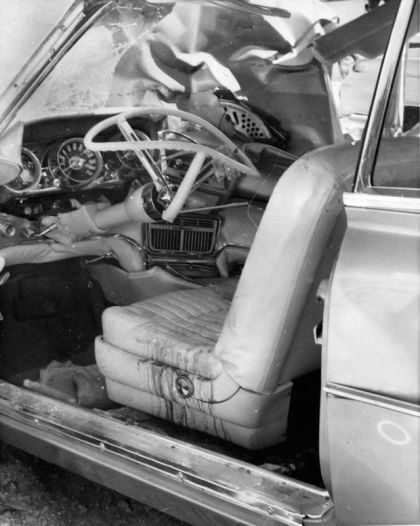 He noticed the metal blinker lever was missing from the left side of the steering column. Evidence in hand, Arthur was sure what he was about to deliver at the surgery center. “Even though Dad was confident, the rest of us weren’t,” said son Ed Lampitt, 45, a U.S. diplomat currently based in Virginia. The three other sons include a Roman Catholic priest for the Peoria Diocese; a computer management specialist in Nevada; and a software marketer in San Francisco. 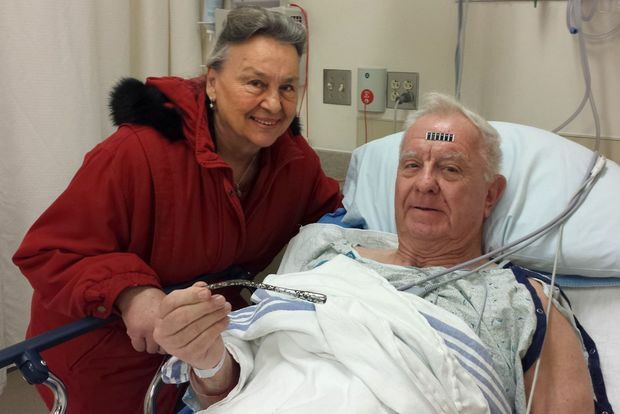 After less than 45 minutes with the knife Wednesday morning, hand surgeon Dr. Timothy Lang entered the waiting room at City Place Surgery Center on North New Ballas Road to give Betty the news she and others had been awaiting. Indeed, it was the turn signal lever. “Seven inches long,” Lang told her. “Oh, my God,” Betty said. Lang explained how a protective pocket had grown around the lever. Shortly after the procedure, Arthur was in a recovery room with two large bandages on his left forearm and instructions for antibiotics. The sterilized lever, heavy for its size, lay beside him. Still a bit dazed by the anesthesia, Arthur took a few glimpses of the lever that had been hiding in his arm for 51 years. Other than being surprised by how corroded it was, he didn’t look long. He wasn’t sure what he’d do with the lever. He said he’d probably hold it a lot, maybe make a key chain out of it. “We’ll figure out something, I am sure,” he said. Hours later, he was doing well. As soon as he got home to Granite City, he took off to work on an old house he’s fixing up.